The design expresses the elegant character of a modern work place – the functional requirements blend a highly active environment with planning strategies that achieve natural light and views throughout. 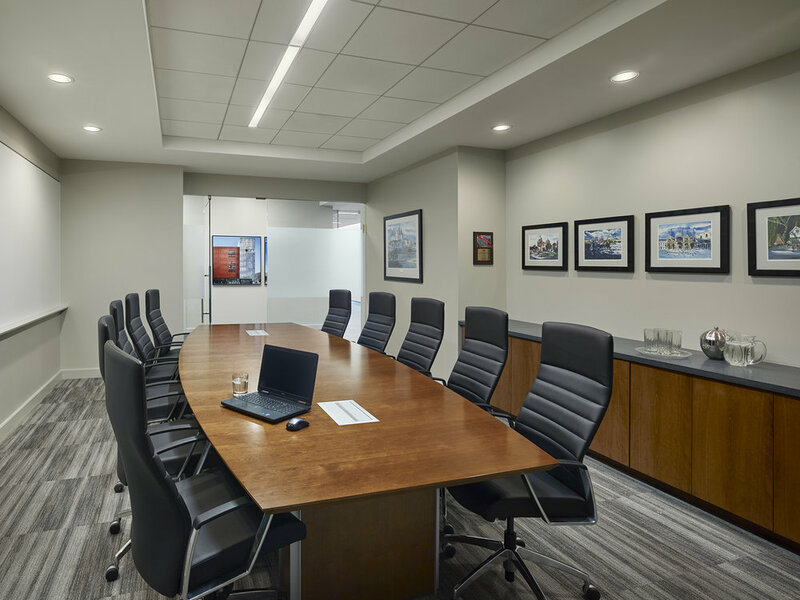 L2P was engaged by INTECH to design their new headquarter space across Market Street from their previous office, which INTECH occupied for 15 years. The planning strategy utilizes a ‘neighborhood’ arrangement; glass front offices are placed around clusters of workstations to support their strong teaming work style. The entry sequence is defined by strong branding elements at the elevator lobby and adjacent client boardroom. The reception area incorporates a variety of materials and textures to showcase their wide range of projects and craftsmanship. The primary departments within the organization, Pre-Con and the Project Management division, are centrally located to enable efficient work flow and encourage collaboration. Support groups such as finance and marketing are strategically located adjacent to these primary functions. healthy culture and are easily accessible to encourage regular use. The Café is a flexible environment for dining but also serves as a collaborative hub for casual meetings, events and organizational gatherings. Strong branding elements throughout consistently promote INTECH’s unique approach to construction and showcase their global presence.